A meeting of influential Papua New Guineans has heard that an effective workforce is needed for equitable service delivery throughout the country. 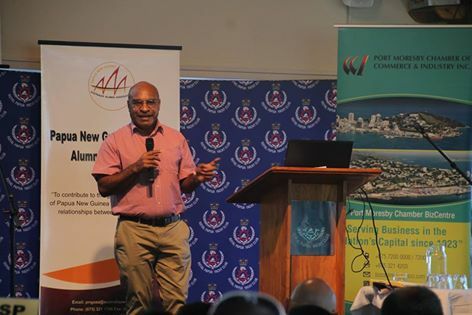 Lead Advisor to the National Government’s Medium Term Development Plan (2016-2017) and PNG Vision 2050, Mr George Bopi said this at the 3rd Leadership breakfast dialogue co-hosted by the PNG Australia Alumni Association (PNGAAA) and the Port Moresby Chamber of Commerce and Industry. Mr Bopi emphasised the importance of worker-management engagement for the country to produce both an educated and problem solving workforce business and industry needs. “There are gaps in what is taught and what the job market requires,” Mr Bopi said. “I encourage workers and employers to invest in skills that they need now and anticipate what they will need in the future. “Individuals should take the time to assess their own goals and satisfaction drivers to clearly define what success looks like for them. They can expect help, coaching and guidance along the way but at the end of the day, they own their engagement. The Leadership breakfast is part of PNGAAAs initiative to create a development dialogue among well-established business women and men and alumni who discuss and share ideas about the country’s development. Topics covered at the breakfast included identifying core skills and attributes in employees that would contribute to an effective and productive workforce for enhancing Papua New Guinea’s development. Attendees included senior managers from the private sector and PNGAAA members. George Bopi is a strategic management specialist and educationalist who has made significant contributions to human resource development and management in PNG. As the Principal strategic management consultant he has conducted management training and installed performance management systems in organisations such Ok Tedi Mining Limited, Puma Energy, PNG Power, Brian Bell, SP Brewery and multiple PNG government departments. Since 1996, more than 2000 Papua New Guineans have successfully completed studies in Australia. The Australian Government supports the first year of PNGAAA membership for all awardees returning from their studies.